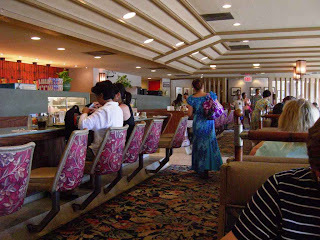 This place is popular with Tourists, probably because it is one of the few places on Waikiki Beach where you can get breakfast for two for under $20. It's right across from the Hilton Resort Complex, so I can understand people looking to save a few bucks. By the way, they get more than their fair share of locals, so it is not just a tourist haven. The draw for me was that it was probably going to be good if as many as 30 people at any one time were willing to wait 10 to 15 minutes to get in just for breakfast. There are occasionally a few open seats at the counter, so you don't always have to wait if you can handle counter service ... The Partnerin likes booths, so we waited. I kind of like the 1970s feel to the place ... makes me think of Five-O. But it was worth the wait. 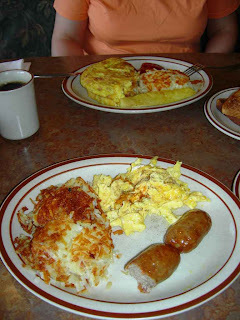 Here you see in the foreground the Scottish Bangers breakfast (yes, I couldn't restrain myself from digging in before taking the picture) and in the background the Irish Breakfast. 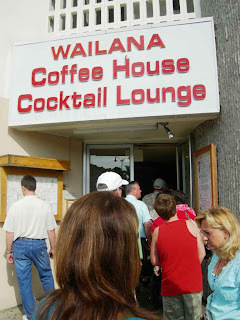 For roughly $9 each, you get eggs and meat, hash-brown potatoes, juice, toast, and a drink ... this, by the way, is health food in Hawaii. They don't have Spam on the menu, but you can ask for it if your really want it. It's one of the few places in the world where the locals make me feel anorexic (Nebraska was another). And they are open 24 hours if you are still jet-lagged and twelve hours off your schedule. The food is good and the price is reasonable in the local scheme of things ... go there! Sorry, no GPS, so no Coordinates, but it is right across the street from Fort De Russy and the Hilton so you can't miss it. Gotta love a big artery clogging breakfast!